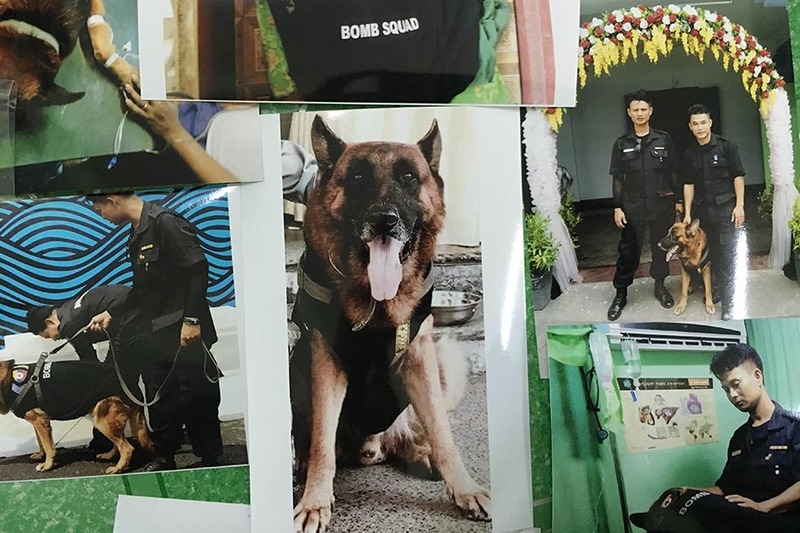 RANGOON — Rambo, a one-and-a-half year old sniffer dog, has temporarily replaced German Shepherd Michael in Rangoon Division’s bomb squad after Michael died of gastrointestinal problems during Thingyan celebrations on Saturday. Black Labrador Rambo finished his six-month training in February and worked with Michael at five events in Rangoon, according to his handler, Private Aung Thu. There are four sniffer dogs on duty with bomb squad teams in Burma, assigned separately in the capital Napyidaw, as well as in Rangoon and Mandalay. Rambo will fill in for Michael with the squad until the police have selected an appropriate dog to permanently take on the role. Michael was five years and four months old when he died over the weekend. He started training at the Mingalardon Central Military Dog Training Academy in August 2012 and joined the bomb squad in February 2013. He was promoted to sergeant after helping his team find and disable four improvised explosive devices in the divisional government office last year. He was on duty when he fell sick on Saturday at Rangoon’s Central Pavilion, where the city’s chief minister and international diplomats celebrated the annual Thingyan water festival. Michael’s handler, Lance Corporal Aung Phite, and wife Daw Myint Nwe Win held last funeral rites for him on Wednesday at the police quarters in Rangoon’s Yankin Township, where mourners donated food and other offerings to Buddhist monks. The government granted 40,000 kyats (just under US$30) monthly for Sergeant Michael’s care, which his handler family said was “not enough at all” for his food and allowance. He carried out his duties at nearly 600 important events in Rangoon and Naypyidaw during his four-year service with the squad, including working during the 2014 visit of former US President Barack Obama to Burma, as well as the 2013 Southeast Asian Games, state-level events, presidential visits, football matches, and motion picture academy awards ceremonies, according to Lance Corporal Aung Phite.